One box on my route has consistently had hair in it. Once when I checked it, there was also a big old bumblebee on the top of the hair. 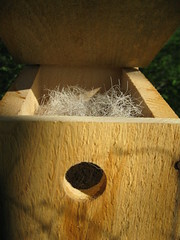 I asked a fellow nest box monitor about it and she said that it is not uncommon for bumblebees to do something like that in a box. I decided to leave the hair and see what happened. If it was a bumblebee nest, I thought it would be interesting to observe. Earlier this month, though, there was still lots of hair, but no evidence of bees, so I removed the hair. Yesterday, when I returned to that box, there was more hair… And this time, I met the culprit: not a bumblebee at all. Who is that in my box? You look sleepy… Did I wake you? I think I’ll name her BumbleMouse. What a find! Your shots of the mouse are adorable! That little pink paw just got to me! I’d be glad to have them find a snug home outdoors so they didn’t try to come into my house — where my three cats would kill them. Where is the mouse finding all that hair? 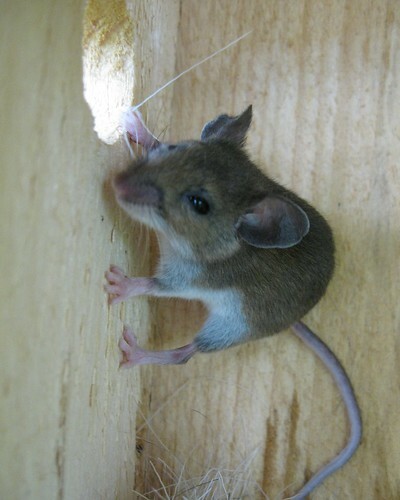 You have to admit, mice are cute. Ok. That’s just darned cute. 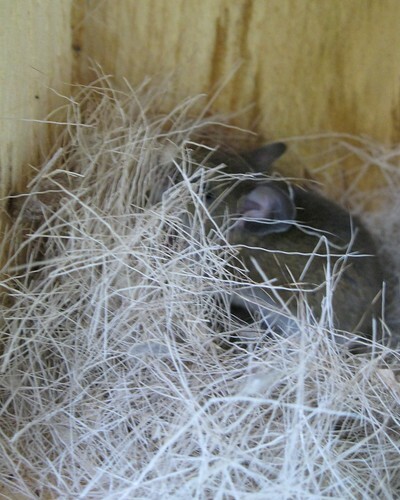 I have had a mouse nest in a bird box for the last 2 years–gave up on it for anything else. 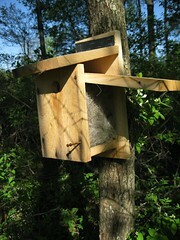 My winter wren house does have a bumble bee nest in it. I let that go too–they are good pollinators for the garden. The mouse photos are really nice. Love it! 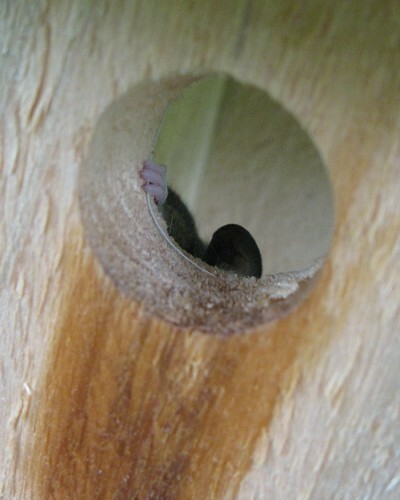 What a great series of photos, and what an interesting resident in the bird-house! If we’re not mistaken, that’s deer hair in the nest — if broken in half, it should be hollow inside, and there is probably a deer carcass in the vicinity. 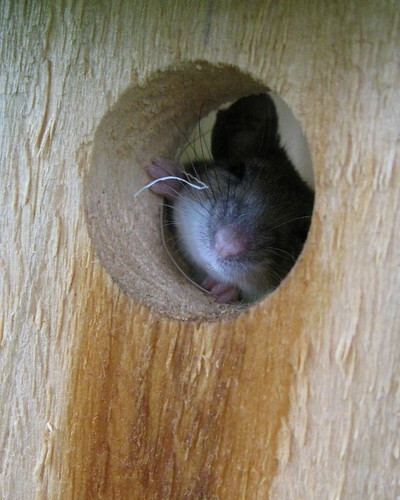 That mouse has certainly found a cozy home, and made it even cozier. Perhaps there will babies soon? That is one cute mouse. Ideal meal for a Screech Owl if he stays around. I love to see them but not in masses. Excellent series of shots! Like Jackie, I especially love the one with the foot in the opening! Perhaps not a bird, but a cute bird box visitor nonetheless.